(From Sony lens literature) Specially designed APS-size CCD imagers like the Exmor ™ sensor of the Sony® alpha DSLR-A700 camera, this amazingly compact premium zoom lens provides superior all around performance. Its 35mm-equivalent range of 24mm wide-angle to 157.5mm telephoto excels at capturing faraway subjects, sports events, dramatic landscapes and intimate close-ups. We have now tested both a pre-production and production version of the 16-105mm ƒ/3.5-5.6 lens, and have the results of both lens tests available for your review. The short version of comparing the two is that it underscores the variation in samples, and there are some noteworthy changes to the lens as it went into production - not all for the better. The 16-105mm uses 15 elements in 11 groups, with 2 aspherical elements. The lens itself uses 62mm filters, and the filter mount won't turn during focusing or zooming. It ships with a petal lens hood and a carrying case. 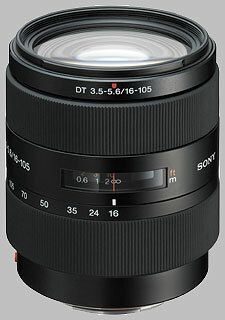 The 16-105mm, on a Sony digital body with a 1.5 crop factor, present a field of view of a 24-158mm lens in 35mm film terms. It's important to note the Sony 16-105mm is a reduced-frame lens design, optimized for the smaller digital APS-C sensor size. This means that mounted on a full-frame film or sensor camera body, it will vignette to some degree. The lens is available for around $580. The Sony 16-105mm ƒ/3.5-5.6 achieves excellent results for sharpness with the most popular of its aperture / focal length combinations, with several notable exceptions. At wide angle and wide open (16-24mm) and at ƒ/3.5, the lens performs admirably, with extremely sharp results in the center, but some noticeable corner softness. It's a bit sharper at 24mm than 16mm. However, at 50-75mm, with the aperture still as wide as it will go (at this focal length, ƒ/5-5.6), corner softness ramps up steeply, going from just over 2 blur units at 24mm to near the top of the scale - almost 12 blur units - at 50mm. Stopping down the lens even just one stop improves sharpness dramatically: the optimum focal length / aperture for this lens is at 35mm and ƒ/8, where the lens is as sharp as our test can detect. At ƒ/8 corner softness is a non-issue across all focal lengths. Diffraction becomes a major factor at apertures smaller than ƒ/22, producing uniformly soft images in all focal lengths. It's interesting to note that this corner softness has increased from the pre-production sample to the production sample. There are marginal gains in center sharpness, but I would suggest that these are more than offset by the increase in corner softness, particularly the wild results at 50mm. It's a remarkable transition here - near tack-sharp results in the central circular third of the frame, then fading to near complete blur in the corners. The Sony 16-105mm ƒ/3.5-5.6 provides excellent resistance to chromatic aberration, where it is only a noticeable factor when the lens is set to its telephoto setting (105mm). At 16mm, the chromatic aberration in an image represents (at its worst, in the corners of an image) no more than 7/100 of a percent of frame height; this improves as the focal length zooms out, and some CA re-appears at the telephoto end, but no more than 9/100 of a percent. There isn't much of a change in resistance to chromatic aberration in the production sample of the lens, presumably because the composition of the elements themselves has not changed. The lens does have issues with vignetting, especially when set to wide-angle. At its worst, wide open at ƒ/3.5 and 16mm, the corners a full stop darker than the center, and at at other apertures at 16mm, the corner darkness hovers around one-third EV darker. Still at 16mm but stopped down, the effect is less severe, mostly around a half-stop darker. At other focal lengths and apertures, corner darkness is not an issue. We noted on the pre-production lens that there was an odd ''spike'' in the shading graph when the lens is set to 105mm at ƒ/22, which produces a half-stop of darkness in the corners; this has been fixed in the production sample, but vignetting has worsened with the lens set to wide angle (16mm) and stopped down to ƒ/16 or ƒ/22. The lens deals well with distortion, and seems to be optimized for around 20mm. 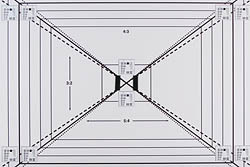 As is typical of lenses with a wide-angle setting, there is prominent barrel distortion when set to 16mm, but no more than 1%. At 24mm and above, distortion is mostly pincushion, and hovers at around 0.5% - mostly noticeable in the corners. Distortion results between the pre-production sample and the production sample are essentially the same. The focusing operation of Sony 16-105mm ƒ/3.5-5.6 is conducted mechanically, but even with this limitation the autofocus racks through very quickly, at less than one second for the entire range. While the lens isn't a dedicated macro lens, it holds its own in this regard, focusing fairly close (214mm, 8 3/8") to the subject. The minimum field of view at this range is 102mm (4"), providing a magnification of 0.24x. The lens is very well constructed, with a rugged plastic mechanism, that has no feeling of cheapness to it. The zoom actuation is very smooth, taking only a quarter-turn to go from 16mm to 105mm. There was a very slight stickiness when turning the zoom, but given this is a pre-production lens we can't really hold this against it. The lens does have a distance scale. The focus ring is quite stiff and has very little travel, perhaps 1/5 of the diameter, which makes it very difficult to manually focus accurately. You can hear the gears whirring as you turn the focus manually. Being gear-coupled, manual focus can only happen when the camera is in MF mode. That said though, at least the A700 has an AF/MF button that will let you quickly switch between manual and AF modes. The A100 lacks this feature. The lens is fairly resistant to zoom creep, but it will creep if held pointing up or down and jostled sharply, but not if just hanging there. It would probably creep if it were swinging around at the end of a neck strap, but wouldn't be likely to move if you were simply aiming the lens up or down to get a shot. Right now, this is all you can get in a similar optical range from Sony; the 16-105mm, at the time of writing, isn't on store shelves. Sharpness is a mixed bag, but a better mixed bag than our production sample of the 16-105mm. The 16-80mm is a hair worse at dealing with chromatic aberration; distortion is about the same, but the 16-105mm vignettes more. The only other Sony product available the time of writing with the same general focal and aperture range, the 18-70mm isn't near as sharp as the 16-105mm, and has much worse tolerance for chromatic aberration. 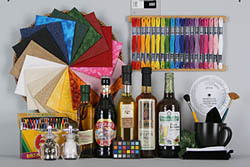 It vignettes less; significantly, it costs much less. The Sigma comparable offers just slightly less capability in the focal lengths. It isn't as sharp as the Sony, fairs a little better with chromatic aberration, vignettes a little better, and distorts about the same. When we initially posted results of the pre-production version of this lens, my suggestion that the 16-105mm f/3.5-5.6 could be a better lens optically than the Sony 16-80mm f/3.5-4.5 DT caused a bit of a stir on various camera and lens message boards. Indeed, the pre-production version had some excellent results for sharpness, but it seems (at least, for this production sample) Sony has made some adjustments which wring out a bit more central sharpness at the expense of corner softness, excessively so in the 50mm and ƒ/5 setting. You don't get these kind of results with the 16-80mm - there are some soft spots, but they're much better controlled. So the real story here is that if you're interested in this lens (and you should be - there's a lot to like), you should make full use of a probationary return period to take some sample shots and see if the lens is living up to your expectations. And as I reflect upon that last sentence, I suppose that's probably good advice for any lens purchase. It's worth noting that right now, these sample photos were taken with the pre-production version of the lens. I use this lens now nearly for two years. Aprox. 15.000 shots later I am still amazed how good this lens is. The sharpness is only surpassed by some SONY fixed lenses I tried (e.g. the excellent 35mm SAM 1,8). The Sigma Zoom 17-70 2.8 and the Tamron 17-50 2,8 are much softer in the corner and the colours are different from the typical SONY colour-style. The only negative is the creeping if you hang your Camera with this lens over your shoulder and walk. After a short distance it is extended to its full length. I use a 7mm broad elastic rubber band around the Zoom ring, a bit overlapping between Zoom ring and lens body helps to solve this problem. This should not happen with such an quite expensive lens. Sony should learn a bit about German engineering from their partner Zeiss. is a Great lens better than it thought it was going to be cause this is my second kit form Sony the first was a A200 which came with a 18-70 /and the 18-70 is not so hot to me it feel cheep but the 16-105 that came with the A700 feel like a Pro lens and act like one also..
A bit of a darkhorse that competes with the Zeiss 16-80 in Sony's own lineup. The minor drop in sharpness in comparison to the Zeiss is worth the gain in build quality, and the added zoom range. An excellent lens that costs less than the Zeiss, and should be more popular than it currently is.